This beautiful hand crafted dream catcher is made using natural cane and woven with a long-lasting wax covered thread. Measures 45 inches by 18 inches. 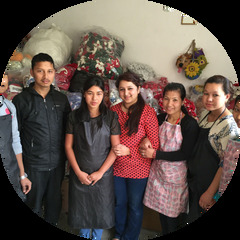 dZi Inc. has been working with artisans in the Tibetan exile community in India since 1990, and with Nepali artisans involved in traditional Tibetan style crafts since 1995. Their products are marketed as part of dZi’s ‘Tibet Collection’ line. Authentic cloth prayer flags printed on hand-carved woodblocks are specially made for dZi by The Gu-Chu-Sum (9-10-3) Movement of Tibet, established in 1991 and based in Dharamsala, India. Gu-Chu-Sum was first organized by ex-political prisoners from the Tibetan freedom movement; monks, nuns and lay people who had escaped from Tibet due to political persecution. Its purpose is to provide employment and support to Tibetan refugees needing help in India, and to educate about human rights abuses in Tibet. You can try to visit www.gu-chu-sum.org, but the Chinese Government regularly sabotage their site! dZi’s screen printed prayer flags are made by the Tibetan Nuns Projection (TNP), also based in Dharamsala, India. TNP’s mission is to provide a safe and supportive environment and education for Tibetan nuns who have fled Tibet for reasons of religious and political persecution. Visit tnp.org to learn more. dZi’s Paper Prayer flags and incense are made by Tibetan Handicraft in Kathmandu Nepal, a member of Fair Trade Group Nepal and leader among the handmade paper export community. This business supports hundreds of people in the local community through it's income generation enterprise, and runs an elementary school providing free and low cost education for local children. Sales of the all the above-mentioned products help to support the mission of these organizations and businesses.